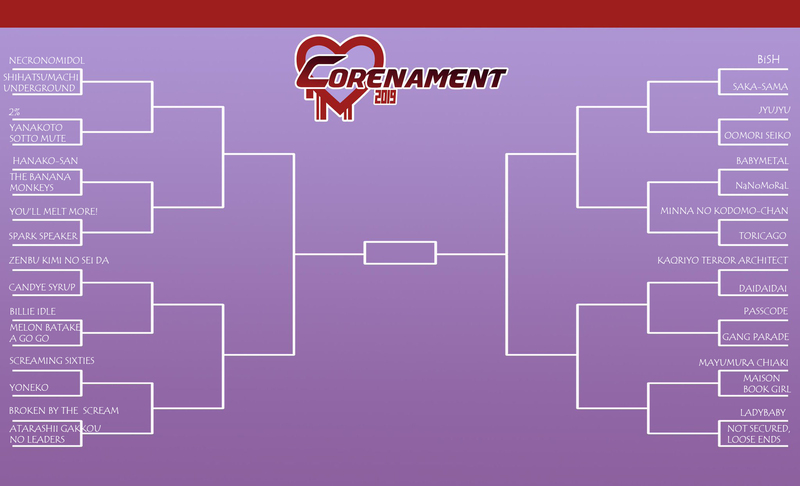 All righty, folks, the Big Dance has finally arrived, and now begins the arduous process of crowning a new Corenament champion for 2019! I very literally cannot believe that this is the fourth iteration of this contest. You’d think that we’d have better things to do! If you need background, go read the primer. If you need assistance, friend, there isn’t any. All I can say at this point is that Sister Jean’s promise to Hanako-san from last year is still unrealized, and that there’s still plenty of lingering, simmering resentment not just from last year’s outcome, but come the shocking conclusion to Queen of the Scene as well. Milcboy will not be denied! How are we competing? Music videos! Which ones? IT’S COMPLETELY RANDOM! If you’re at all familiar with the NCAA Tournament, you know very well how random performance can be from one game to another — to win the thing, not only do you need to be able to play your best for six straight games over three weeks, but at a level that’s at least one score better than your opponent in every one of those games. Slip up a little bit, try to relax, not take your opponent seriously, happen to have a bad game, happen to have an opponent who’s a terrible matchup for you? See you next year, chump! tl;dr — vote for the better video in each match! And so it goes here. Rather than say, oh, you’re going to be putting your best foot forward at all times, idols, you’re going to be putting forward whichever foot the whims of fate — me — decide will be representing you that particular match, and you’d better hope that it’s at least as good as what your opponent’s bringing. For newer idols with limited video material? It’d better be good! For established idols with spotty overall bodies of video work? Good luck! The prize? NOTHING. Well, pride, I guess. That’s the best part of this. Kamen Joshi and Minna no Kodomo-chan both won because manager-san and/or Big Fan-san hooked it up for their fans to influence — just like in real life, the noise and support from the most ardent of supporters can make a big influence on an outcome. And why make the effort? For stupid, solitary pride, and starring in fanfic. Let’s get to it then. We’ll do the first round as halfies today and tomorrow, and the rest over the weekend, which will leave us with a Sweet 16 at the same pace as the IRL tournaments. Tip off is right now!